Aug 2018 – New Export Order! What was the first order for? 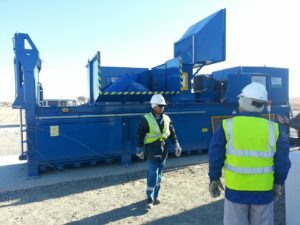 The photo is of the first baler we supplied 6 years ago to an oil refinery near the Caspian Sea, this was required to bale piles of waste water bottles and waste plastic drums that had accumulated over many years. The baler had to be designed to operate in extreme conditions of very cold (-40°C) to very hot (+40°C) with high hunidity. Why did WHS supply this particular Baler and what was special about it? We involved the client all the way through the design process until both parties were satisfied it was the correct solution and within budget. The baler was 30% over-powered so it would never be working at its maximum, to ensure longevity and reliability. It was not over complicated from a technical perspective so maintenance could be handled by their own engineers and any problems diagnosed quickly. WHS also used as many readily available electrical and hydraulic components as possible for the same reason. It was a very robustly engineered construction and was fitted with some specific features for this client e.g. a bottle piercer which could be easily put in and out of position depending on whether they were baling bottles or not. It also had an oil heater to allow operation in the winter and an off-line oil cooler to maintain the required operating temperature in the summer.